NOTE: The WSIM model makes use of seasonal temperature and precipitation forecasts produced by the U.S. National Oceanic and Atmospheric Administration (NOAA) Climate Forecast System Version 2 (CFSv2). These forecasts predict broad temperature and precipitation patterns, but do not effectively predict singular events such as tropical storms. Detailed outlooks and analyses of tropical storms are available from the NOAA National Hurricane Center. 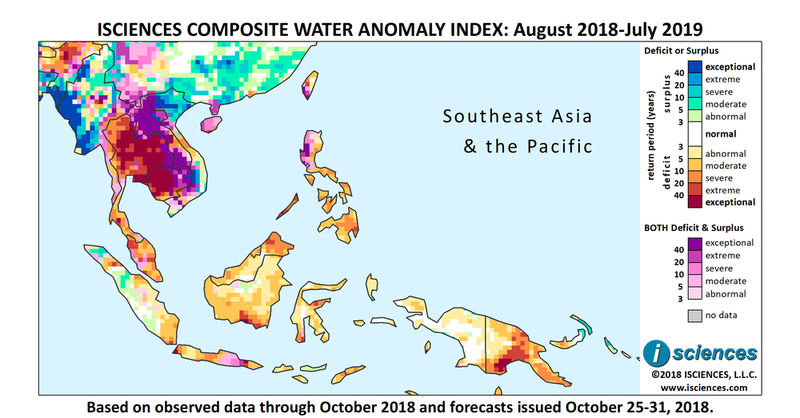 The 12-month forecast through July 2019 indicates exceptional water deficits in much of western Cambodia, and severe to exceptional deficits throughout Thailand. Deficits of varying intensity are expected in Malaysia, pockets of Indonesia, the Philippines, and Papua New Guinea. Water surpluses are forecast for Myanmar, northern Vietnam and Dak Lak Province in southern Vietnam. Surpluses are expected to be exceptional in western Myanmar and the Irrawaddy Delta. The near-term forecast through January indicates that intense surpluses in Southeast Asia will shrink and downgrade, but exceptional conditions remain in the forecast for western Myanmar and northern Laos. Severe to extreme surpluses are expected in eastern Myanmar along the Sittong and Salween Rivers and in northern Vietnam. Deficits will emerge in central Myanmar, central Laos, and central Vietnam. Exceptional deficits are forecast to persist in the bulk of western Cambodia and severe to exceptional deficits will increase in Thailand, encompassing much of the county. Conditions in the Philippines will transition from surplus to deficit. Moderate surpluses are forecast for Sumatra, peninsular Malaysia, and West Kalimantan in Indonesian Borneo. Deficits are forecast in Papua New Guinea and in pockets throughout Indonesia. From February through April, many regions of prior surplus will exhibit both surpluses and deficits (purple) as conditions continue to transition, including Myanmar, Laos, and eastern Cambodia into southern Vietnam. Exceptional deficits will shrink slightly in western Cambodia. Deficits will downgrade somewhat in Thailand but remain widespread; will increase in central and southern Vietnam; and will intensify in the Philippines. Aforementioned surpluses in peninsular Malaysia and Sumatra will transition to deficits, while some surpluses are expected to emerge in central Java. Deficits remain in the forecast for Papua New Guinea and scattered pockets in Indonesia. Flooding triggered massive mudslides that killed 27 people and devastated part of an elementary school in Indonesia’s North Sumatra last month. The disaster comes less than a month after a powerful earthquake and tsunami hit the Indonesian island of Sulawesi, killing nearly 2,000 people. Super Typhoon Yutu pummeled the Northern Mariana Islands late last month, prompting President Trump to declare a major disaster in the US commonweath. Tied for the most powerful storm on Earth this year, Yutu killed at least one person and injured others, and caused extensive damages to neighborhoods, schools, businesses, and airports. Flash floods in the Keerom regency of Papua New Guinea swept away several homes in the middle of the night and caused serious damage to almost every house in the district. A heavy downpour lasting over 90 minutes flooded Penang International Airport in Malaysia late last month. Floods damaged over 2,000 hectares (4,942 acres) of rice paddy in the Mekong Delta last month. Early-season flooding reportedly peaked early this year, catching forecasters and farmers off-guard. Looking ahead though, Vietnam’s Department of Cultivation under the Ministry of Agriculture and Rural development is advising regional localities to reserve water for this year’s winter-spring rice crop, as an El Niño event threatens to cause drought and salt water intrusion. Thailand’s Office of National Water Resources declared 32 districts of the northeastern Nakhon Ratchasima province as drought-hit areas. Dry conditions have damaged over 112,000 hectares (277,000 acres) of farmland in the province this season. Production of popular rice variety hom mali is expected to drop 10 percent due to drought damage.